Put your best face forward at the checkout counter with ePaisa’s integrated POS hardware solution, and present a sleek and modern image. Replace your bulky cash register machine with a tablet running ePaisa and expand your usable selling space – perfect for impulse buy items. Seamlessly integrate ePaisa into your application/website to accept payments online or in-store using our payment gateway or card reader. 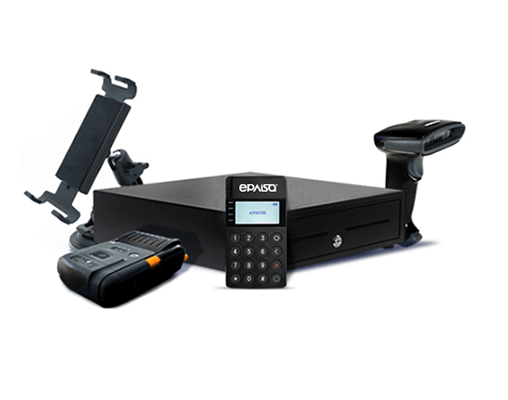 Enhance your ePaisa POS setup with practical hardware accessories and solutions to ensure that nothing interrupts your ability to take payments and run your business. Connect your Point of Sale system to a bluetooth enabled wireless printer, and print beautiful custom receipts. The Bluetooth printers are lightweight weighing about 220 to 330 gms and has a battery life of 500 cycles. Get the small yet robust chip and PIN card readers which use industry leading security standards to maximize data protection. Easy to setup. Just register and create an account. Safely and securely swipe credit cards with the card reader or accept cash, debit, and udhaar. Sync your customer details from ePaisa with MailChimp and start sending stylish email campaigns. Turn your customers into regulars and improve your customer engagement and repeat purchases. Track your email campaign results and know who is coming back for seconds. Businesses can integrate ePaisa card reader with their existing software systems to create customized and complete solutions that meet different business requirements. The ePaisa payment SDK enables you to integrate payments quickly, securely, simply and individually into your point of sale application. Enhance your online business backend with advanced inventory management by integrating your online store with ePaisa. Keep a birds-eye view of incoming sales, stock levels and general store performance and statistics all from the WordPress integration. Automate the labour intensive processes in your business and seamlessly integrate to Tally and Shopify. The ePaisa – Shopify integration enables you to easily link an online Shopify store to your ePaisa account. The integration takes the pain out of setting up your first online store, and makes it easy for you to manage sales, inventory, and reporting. If you’ve already got a Shopify store, you can use the integration to streamline your operations by syncing your inventory and sales reporting with ePaisa. Stop losing time on manual imports/exports between ePaisa and Tally. Unveil the true power of these apps by integrating them. Need to know what your customer ordered right from your CRM? Need to always keep your list up-to-date? ePaisa can do that for you. Your data is always kept in sync. Accessing your ePaisa account anywhere for free. Create an ePaisa account or sign in to your dashboard to get started.